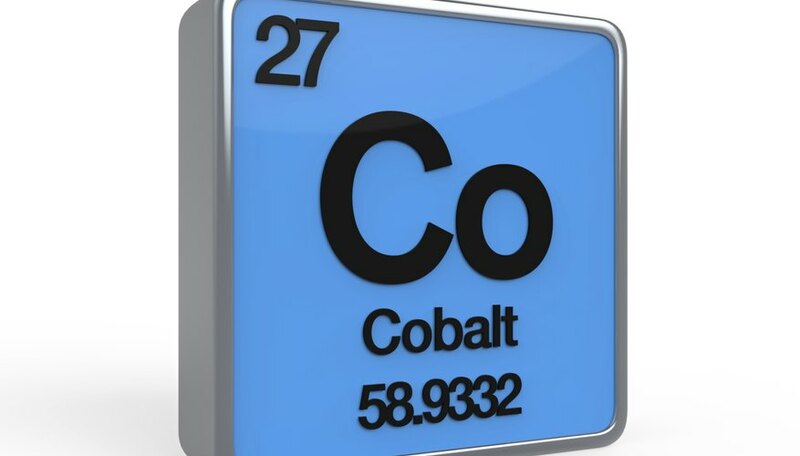 Cobalt, which has the element symbol Co, is a metal usually obtained through mining nickel, silver, lead, copper and iron. In 1739, Georg Brandt discovered it while studying minerals that gave glass a deep blue color. Today, cobalt's uses range from health and nutrition to industry. The US government treats cobalt as a strategic metal because a shortage would affect the economy, industry and defense of the country. Most cobalt used in the United States is imported. Alloys, or mixtures of metals, make up half the cobalt used each year. Some alloys go into making jet engines and gas turbine engines. Another alloy, called Alnico, consists of of aluminum, nickel and cobalt and is strongly magnetic. Alnico magnets can be found in hearing aids, compasses and microphones. Cutting tools can be made with stellite alloys, which contain cobalt, chromium and tungsten. Cobalt is used in electroplating, a process in which a layer of material is applied to an object to give it a particular aesthetic or protective quality. Cobalt provides objects with an attractive surface that prevents rusting. Cobalt improves the performance of rechargeable batteries and plays an important role in hybrid electric vehicles. Cobalt alloys are used in orthopedic implants alongside titanium and stainless steel. The Idaho Cobalt Project states that approximately 70 percent of hip replacements use cobalt-chrome femoral stems. Cobalt-60, a radioactive form of the element, can treat some forms of cancer. The substance can also sterilize medical supplies. Cobalt chloride, sulfate, acetate or nitrate can correct mineral deficiency in grazing animals living on cobalt-deficient soil. Cobalt is an essential part of vitamin B12. Cobalt salts are used to produce vivid shades of blue in porcelain, glass, pottery and tiles. Lisa Rowan is a researcher and blog contributor. She has worked as a reporter, photographer and editor for weekly newspapers in Pennsylvania and New Jersey. A Pennsylvania native, she considers Washington, D.C. to be her adopted home. She is a graduate of the University of Maryland. What New Uses Are Being Found for Rare Earth Elements? Rowan, Lisa. "What Are the Uses of Cobalt?" Sciencing, https://sciencing.com/what-are-the-uses-of-cobalt-12187711.html. 06 October 2017.